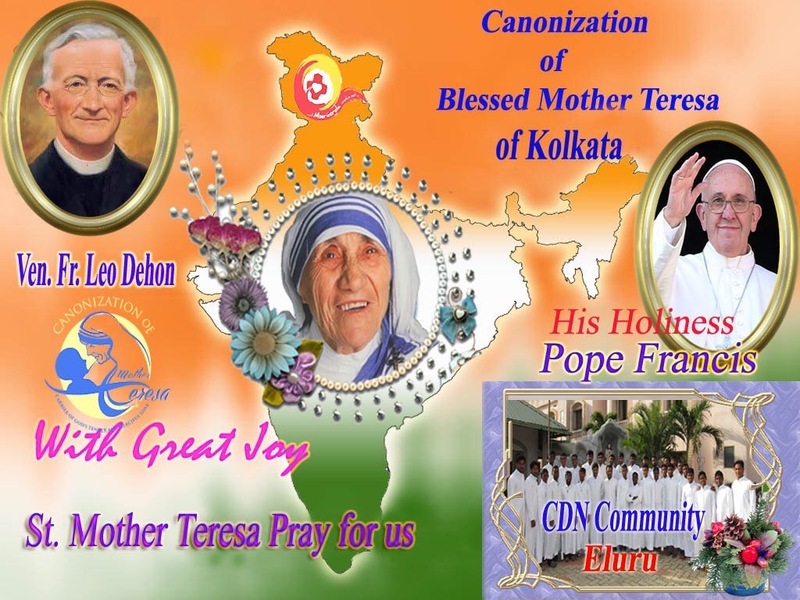 SCJs in India celebrate Mother Teresa’s canonization | Walk with us! ← Busy weekend, including a canonization! Yesterday was a very special day for Indians with the canonization of Mother Teresa of Kolkata in St. Peter’s Square by Pope Francis. The ceremony was broadcast on a number of channels. September 5 will from now on be the yearly date to celebrate the life of Mother Teresa. We joined with the religious of Eluru for a Mass of Thanksgiving and the first Memorial Mass in honor of Mother Teresa. The Mass began at 6:00 pm, or rather the preliminaries began that included a welcome by the rector of Vljnananilayam Institute of Philosophy and Religion, Fr. 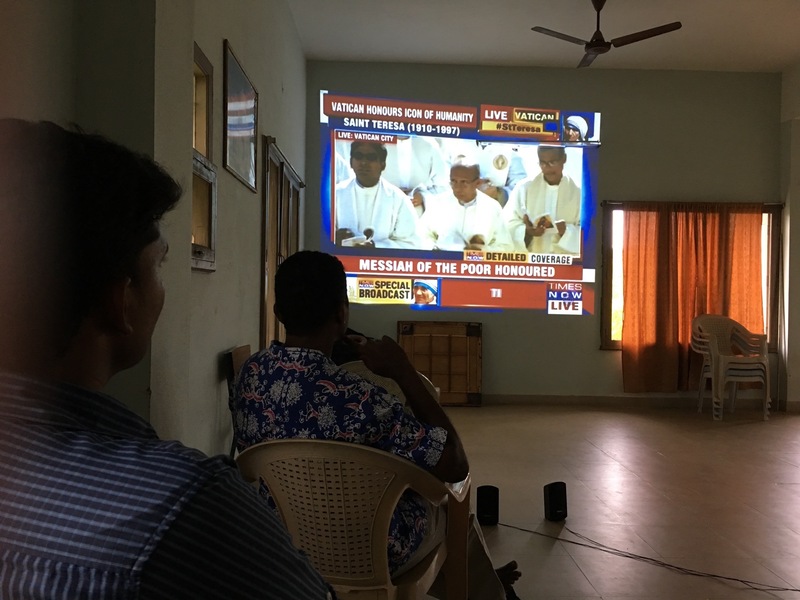 Lourdes Showry, OFM Cap, followed by a short video on the life of Mother Teresa ending with Pope Francis’ proclamation of sainthood from the morning Mass in St. Peter’s Square. After the video the priests vested and the Mass began. Vljnananilayam auditorium holds at least 600 people and though not all the seats were taken I’m guessing we had about 500 participants. Among the communities of women religious were two sisters from the Missionaries of Charity, the congregation founded by Mother Teresa in 1950. It certainly was a proud moment for them and the men and women religious of her congregations serving in over 100 countries around the world. A number of religious communities contributed to our celebration. Two of our SCJs participated in the choir as they often do at special school functions. The servers and deacons were from the Capuchins, who own and operate Vljnananilayam Institute of Philosophy and Religion. Others were responsible for decorations and liturgy planning etc. As is the custom in India all were acknowledged at the close of Mass. When all was said and done we headed home in our van, truck and motorbike by about 8:40 pm. Two of our students were left behind but a quick phone call and our motorbike went to pick them up to arrive just in time for the start of supper. Our cooks, John and Rekha, provided ice cream for the community in honor of their daughter, Shasikala’s, birthday. We, of course, did a modified version of birthday greetings carrying out the ritual minus the cake. Thus ended a very busy and a very proud day for Indian Catholics and truly for all Indians for Mother Teresa, for this little woman with a strong will and a strong heart who did so much for the poor first in India and now around the globe through her priests, brothers and nuns, all true missionaries of charity.